Donte Brooks, Giselle Fuentes and Jennifer Thenor groove with a 60s vibe on Decades Day during Spirit Week last week. 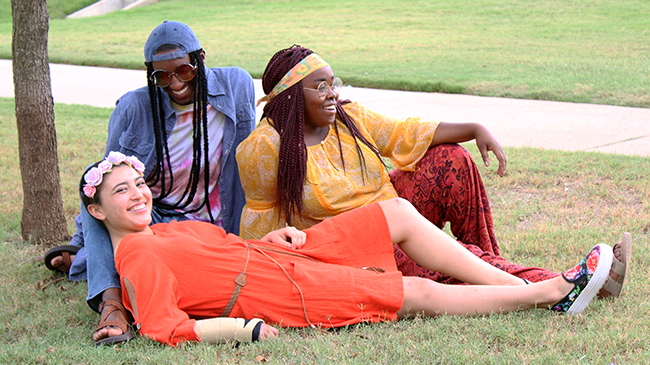 The last week in September is set aside as the annual Spirit Week at Southwestern Adventist University. Last week’s activities featured some crazy costumes to go along with the wacky themed days. Monday, Sept. 25, was Pajama Day, when students were supposed to come to class in their best bed heads and PJs to show that they weren’t quite ready for the weekend to be over. Some students went all out sporting a onesie and some slippers while others went for the subtler pajama pants. On Tuesday, students were directed to buddy up for Dynamic Duo Day. More than one pair of students thought of the same famous duo, Lilo and Stitch from the Disney movie Lilo and Stitch. SA President, Samson Sembeba teamed up with Donte Brooks and dressed up as The Things from the classic Dr. Seuss story The Cat in the Hat. Wednesday was Decades Day. On that day, students picked their favorite decade in world history and dress up as a person from that era. Three girls were really creative and dressed up as ancient Greeks complete with togas and sandals. And since this is Texas, the SA had to throw in a day dedicated to Wild West dress. Thursday was Cowboy/Cowgirl Day. Students and faculty came to class and work dressed in their best Texan attire. Some students came in their Stetson hats, boots and blue jeans. Many from the student body looked like they belonged in an old western film. What made this day a hit was that Dr. George Parry was dressed in all-red cowboy attire with a brown hat to complete the look. This bold choice won him the prize for that day. As the week was ending, the students dressed in their SWAU gear on Friday. Those who hadn’t participated in the other themed days this week definitely did on this day, when everyone showed school pride and sported SWAU T-shirts, sweatshirts, and jerseys. To motivate the students and faculty to get involved, there were some prizes attached with a big raffle prize at the end of the week. Students were told to take pictures of themselves and post them on their Twitter and Instagram accounts with the hashtag #SWAUspirit2017. From there, SA members went through them all and picked a winner. In addition, students added their names to tickets for every day they were dressed up. Those tickets got added to a big raffle and at the end of the week a winner was drawn. Congratulations to all the winners for the week: Saddia Bunting, Elanith Wong, Starr Wallace, Bleidy Pruneda and Ariadna Quinones.